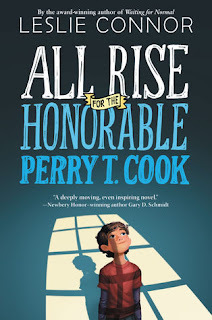 When I first heard about All Rise for the Honorable Perry T. Cook, it shot to the top of my TBR pile. I was really curious to read a story about a boy who was raised in a co-ed correctional facility, particularly since it is geared towards a middle grade audience. As an avid viewer of "Orange is the New Black," I wondered how author Leslie Connor would deal with the challenges of daily prison life. For the most part, she didn't. Perry refers to some of the residents as "cold ones" and avoids them, and he gives privacy to them when they seem sad, but otherwise, the book focuses on creating a family wherever you are. I enjoyed the setting, which is unique for a middle grade novel, but sadly not unique to many readers. As Connor writes in her afterward, "one in twenty-eight school-aged children have a parent in the prison system." Kids need to see their lives in books, and while I don't know if this is realistic, it's a start. It could also help take away the stigma of prison for kids who are unfamiliar with it. There is a lot to learn from seeing the kindness in characters who have made a life-altering decision. I have only one complaint, which seems to be a common quibble for me with recent middle grade novels. This book weighs in at 344 pages, which will intimidate many young readers. If Connor took 100 pages off, the audience for the book would expand so much.